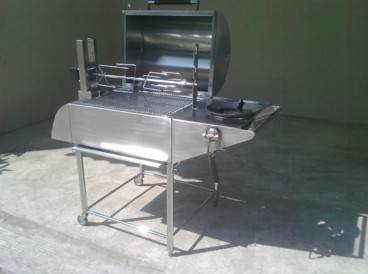 QUIK-FIRE, SS Master Deluxe 4n1 Gas Barbeque – Grill. 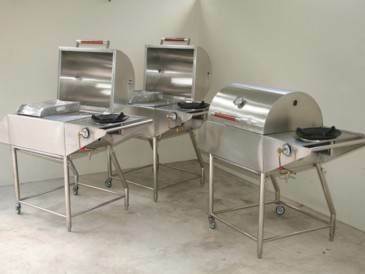 With addition of, Quik-Fire’s, Stainless Rotisserie you’ll have a handcrafted multi purpose bbq that can’t be beat. 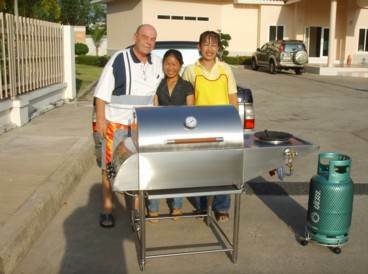 Check this out: You are purchasing a real deal, ‘Oven’, right along with your Barbeque – Grill. However, ‘watch it‘; BBQ Ovens are high performance units so be, attentive! 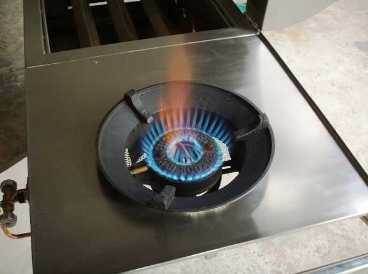 With high Oven heat left unattended for long you may burn your food, as well, in the ‘extreme’ unattended scenario you could wrap interior shell of top! Roast ’em all until meat nearly falls off the bone. Once your Racks of Rib meat is near falling of the bone take ’em out of roasting pan and place them on the grill; add a little sauce to top off that real bbq appearance and flavor. By doing this we can pretty much guarantee they’ll be the most succulent finger lickin’ bbq ribs ever… and you can accomplish this with your very own, Quik-Fire, BBQ – Grill Oven combo. 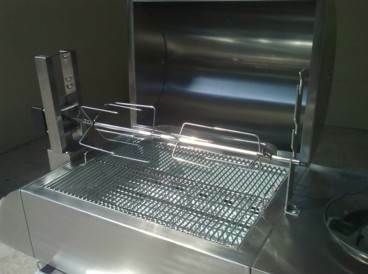 Extra Large Barbecue – Grill area! 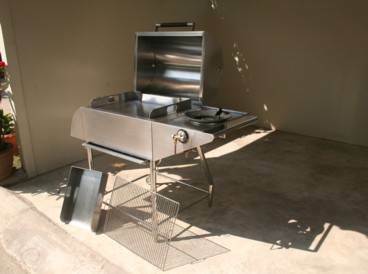 This is another plus; plenty of room to BBQ many favorites at once, or use 50% bbq-grill, 50% hotplate … all up to you. For our Aussie Mates how about, Dual Hotplates, we know you’ll love ’em! 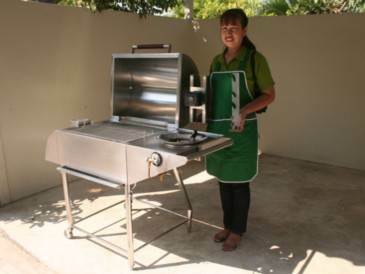 Prepare a Full Sunday Brunch on your ‘Barbie’ for family and friends. 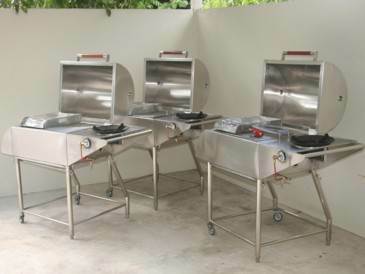 Hotplate bacon & eggs, omelets, snags, home fry potatoes, even pancakes while a few breakfast steaks or lamb chops are smokin’ away on the bbq-grill. When it comes to dinner you’re still on track, with your ice cold beer; more steaks, chicken, pork chops, lamb chops, even ‘veggies’, using Hotplate and BBQ-Grill combined. 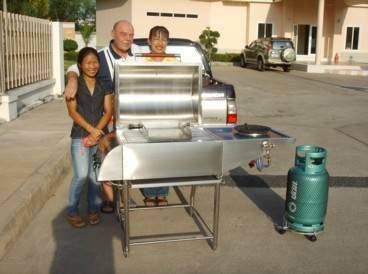 Lets not forget the professional, High Pressure Side Wok Burner, you’ll not find one of these on other bbq’s! 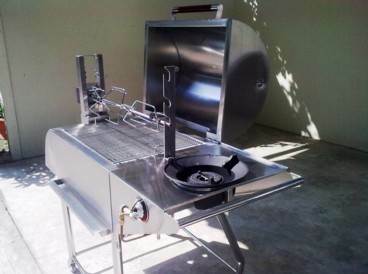 This professional High Pressure side burner will cook soups and stir fry in one third time of common low pressure burners found on other barbecues. Lower your high pressure flames for delicate sauces … of course! Prefer bbqing over, ‘Charcoal’? We’ll craft you a new, SS Super Master Deluxe Charcoal – Grill, for you. 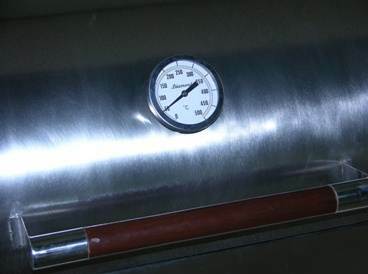 Quality, Stainless housed Oven Thermometer applied to top. 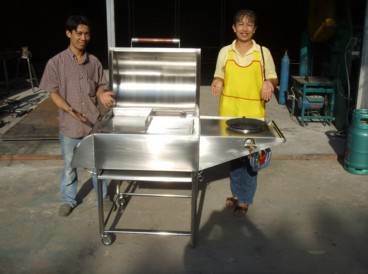 Heavy, ‘stainless plate’ Griddle/Hotplate with 3 sided stainless back splashes. High pressure regulator off gas tank and low pressure in-line regulator to service your bbq. 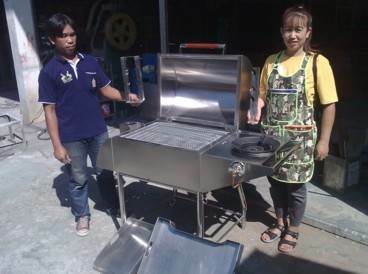 Think about that when considering imported barbecues coming from somewhere, North of Thailand, un-assembled in a cardboard box. Value for your money? Shipping available throughout Thailand and the Islands. Bangkok, Pattaya, Rayong, Phuket, Krabi, Nakhon Ratchasima, Mukdanhan, Kanchanaburi, Buriram, Chiang Mai, Chiang Rai, etc., etc.